This entry was posted on February 6, 2017 by Tinteán Editorial Team/EMcK, in 19th Century Irish Settlement, ancestry, emigration, Famine Orphan Girls, Great Famine, Irish Famine, Orphan Girls. and tagged 19th century emigration, Famine Orphans, Famine Ships, Irish Ancestry. Bookmark the permalink. Looking for ancestors of orphan workhouse girls who emigrated to Australia in 1853. 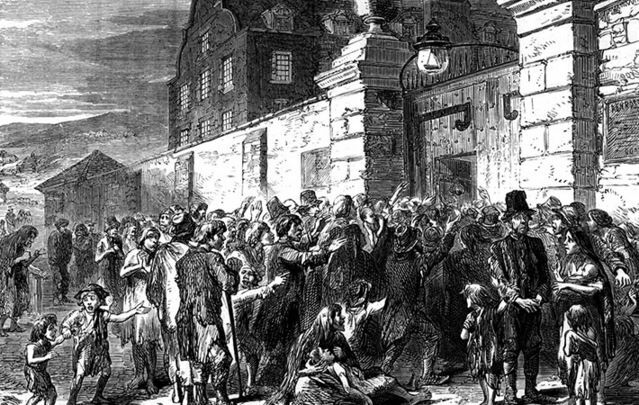 Crowds outside a workhouse doors during the Famine. A group of 33 young girls were transported to Australia on the Palestine ship in 1853 from the Mountbellew workhouse. It was renowned that these bride-ships, carried destitute girls from orphanages, poorhouses or those who had a sponsored fare after the Great Famine. The Mountbellew workhouse at that time, Aug 1852, had 418 inmates and 130 able-bodied females. In November 6 1852 there were 392 inmates and 124 able bodied-females. On November 20 1852 there were 401 inmates in the workhouse, 134 able-bodied females, though 32 able-bodied females were discharged during this week (presumable the 30 for assisted emigration). County Galway was very much affected by the Famine of 1845-47. In 1841 the population was 443,000. Ten years later, it had fallen to 322,000. In early September 1852, an entry in the Mountbellew Poor Law Union Board of Guardian Minutes described a letter from Lieutenant Sunders (R.N. Emigration Agent) stating that the Emigration Commissioners had instructed him to make a selection of 30 young women from the female inmates in Mountbellew workhouse to be candidates for emigration to Van Diemen’s Land, with passage to the colony by the ship Travencore, which was to sail from Plymouth. On the September 10, 1852 there was another entry noting that Lieutenant Saunders Emigration Agent had selected 30 of the female inmates for passage to Van Diemen’s Land, on board the ship Travencore, which eventually sailed from Plymouth. People loading a coffin ship during the Famine. After the success of this first dispatch of workhouse girls, another list of passengers was drawn up and the Palestine later set sail from Plymouth on November 26, 1852. Among the girls chosen to make that fateful journey to Australia was Mary Dooley. Mary and three other girls replaced several girls deemed medically unfit to make the long journey to Australia. This is where their life stories begin. They led interesting lives. These 33 girls traveled over land to Dublin and from there they sailed to Plymouth prior to their departure for Australia. Mary and the other girls arrived in Western Australia on April 28, 1853 after five long, and probably terrifying, months at sea. On arrival, it is believed that Mary found employment as a servant with a local hotel proprietor at The Ship Hotel. Several months later, on January 28, 1854, Mary married Mr John Dawson, who was 26 years her senior. Now the Mountbellew Workhouse Project aims to trace the orphan girls’ descendants in Australia and secondly to look at possible descendants of relatives here in the surrounding localities of Mountbellew, Caltra, Castleblakeney, Moylough, Newbridge, to name a few areas in the west of Ireland. The aim, once they have collated all the descendants, is to reconnect them with their ancestors in Ireland. The group plans on holding a service in Mountbellew to celebrate the orphan girls’ lives in May 2018 and to acknowledge that they were not forgotten, that they deserve to be remembered in Irish history. The project has already heard from some representatives of the orphan girls wishing to attend. The Mountbellew Workhouse Project has made great strides in Australia and has managed to connect with quite a few of the orphan girls’ descendants. They are so excited about this project and eager to assist. Editor’s note: Paula Kennedy is among locals in Galway working on the Mountbellew Workhouse Project to trace the descendants of the Irish emigrants who traveled on board the Palestine ship to Australia in 1853. On board were 33 Mountbellew workhouse orphan girls. The project is trying to connect with as many of the orphan workhouse girls’ descendants in Australia in the hope of telling the girls’ stories, establishing where they came from in Galway and, hopefully, connecting with their Irish cousins. Also, some of the orphan girls’ siblings went to the USA. The project wants to ensure these orphan workhouse girls are not forgotten.